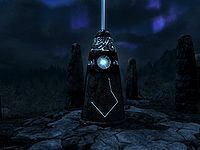 The Shadow Stone is one of the thirteen Standing Stones scattered across Skyrim, and is located south of Riften, east of Snow-Shod Farm, near Nightingale Hall. Once a day, those under the sign of The Shadow can become invisible for an extended period. 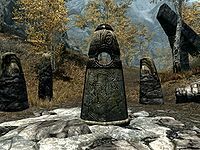 When nearing the stone care should taken, as there is a respawning high leveled conjurer or necromancer lurking by the stone. As soon as you are detected, they will warn you off, if you don't immediately leave they will attack you. They may be accompanied by multiple hostile skeletons who will all attack as soon as you are detected. The stone itself is surrounded by a further nine standing stones that were carved, but show no markings. A few paces to the east, by a fallen piece of masonry is a lootable skeleton with a small coin purse laying on the ground beside it. The power the stone confers is unique in that the invisibility effect takes place instantly, instead of having to cast it like you would with an Invisibility spell, this lack of delay could save you in a tight spot. The power granted by the Shadow Stone lasts 60 seconds or until canceled.